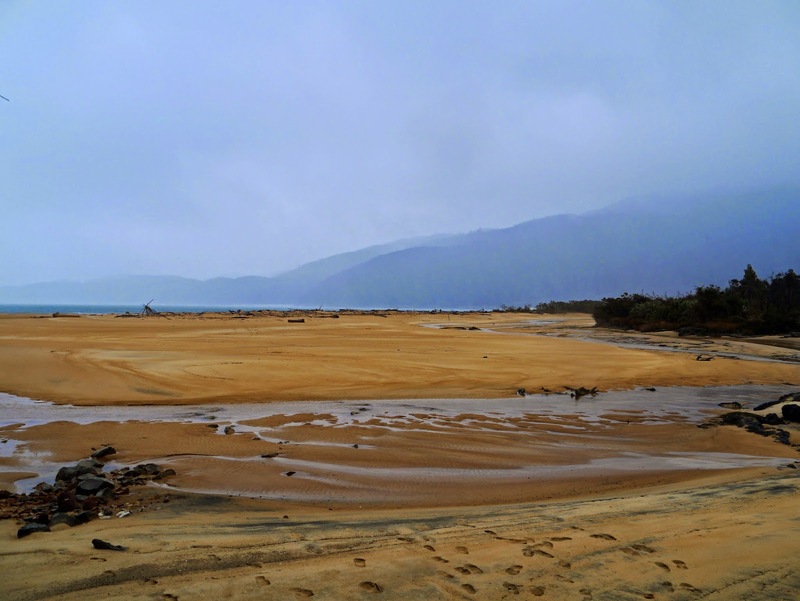 Nature Scribe: Abel Tasman Coast Track 2: Weatherproofed? During the night there is a pattering, pittering, scratching scatter of sound. I hear it only vaguely as I drowsily toss and turn on the bunk, but I know well enough what it is. It’s raining. The sound of rain on a tin roof is supposed to be soothing. Not this morning. We were hoping to avoid anything but light showers. 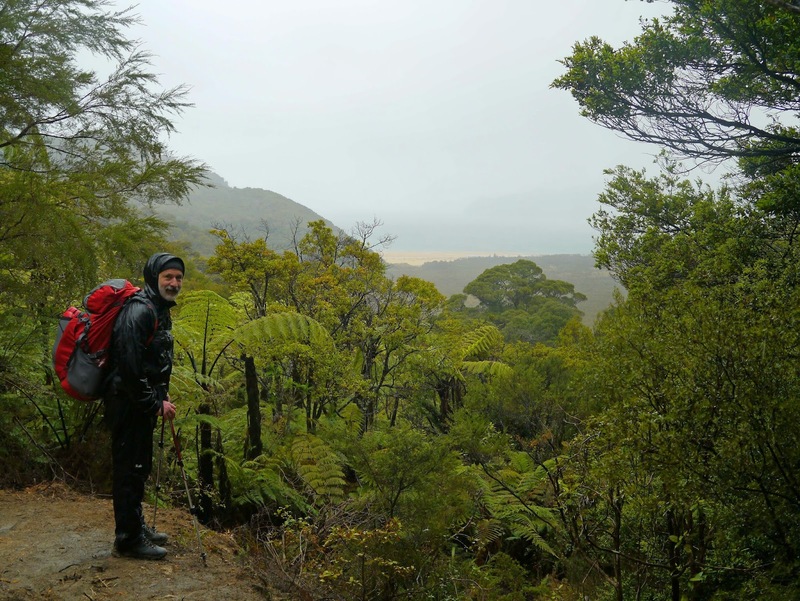 We're in New Zealand for three weeks, and with cycling, tramping and everyday gear to cart around with us, we’ve chosen to carry lightweight, basic waterproofs. It’s October, we reason; high spring. What could possibly go wrong? We prepare slowly, giving the rain a chance to scoot by and leave us with clear skies. It intensifies. 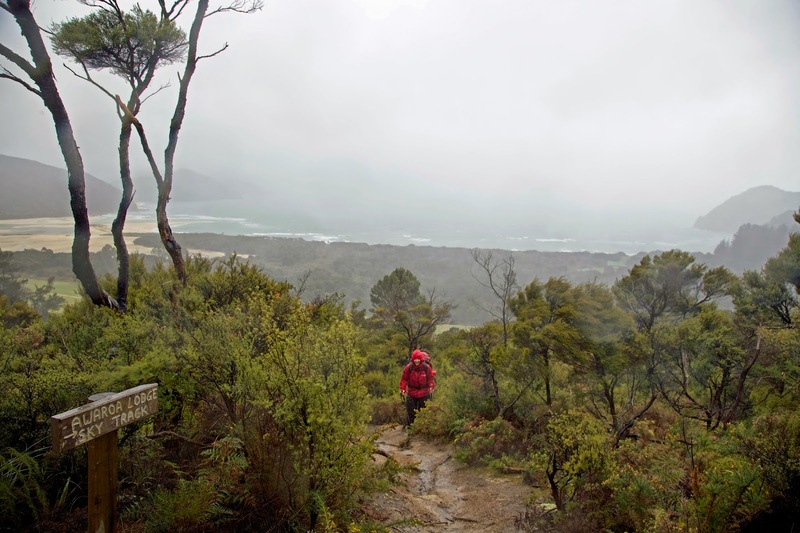 Our hut mates pull on their full gore-tex gear, smile, shrug and walk off into the gloom. We tidy up a little more methodically than usual, then come up with a plan. 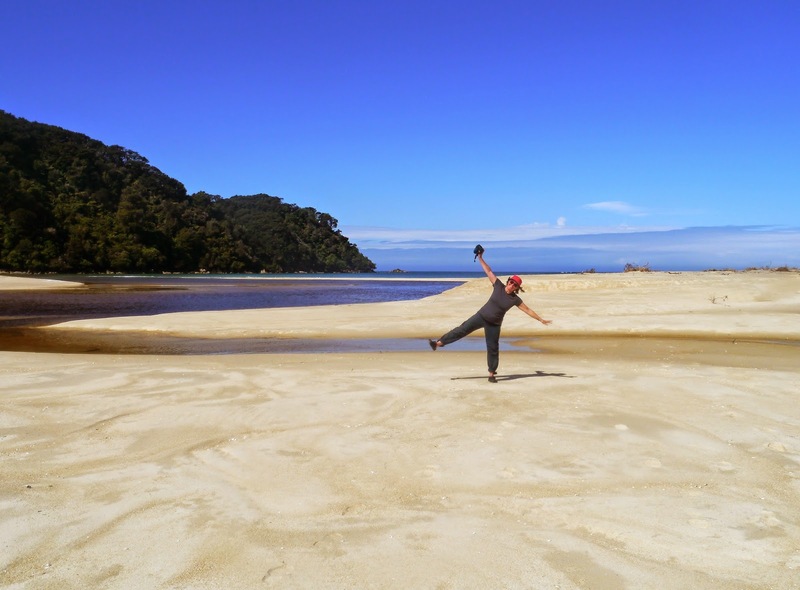 We’ll don our gear and wander around the expansive bay until we find Awaroa Lodge. A hot coffee will brighten up our day, and the delay might even brighten the weather. The jacket I’m depending on is a light and breathable “2.5 layer” job, whatever that means. By the time we find the Lodge – about 45 minutes later – I’m soaked. I’m not sure if it’s the 0.5 of missing layer, but it leaks. And wet is wet. Lynne’s jacket – a cheap-and-nasty single layer thing – is even worse. As we arrive at the lodge, our former hut mates are leaving. The lure of coffee and cake has tempted them in too. The Lodge is palatial, quiet. More importantly, it’s warm and dry. Feeling we must look like Visigoth marauders, we sheepishly take off our dripping gear before heading up to the bar. They smile welcomingly and take our orders as though we’re royalty. Five minutes later we’re sitting in leather lounges and tucking into large coffees and a slab of carrot cake. To say it's all downhill from there would not strictly be true. After the lodge it is steeply uphill. But yes, the weather deteriorates further, and our level of wetness with it. We pause above Awaroa and take a few photos. I have stowed my camera in my pack, thinking to keep it out of the wet. But after reaching the top, I decide I’m being overly cautious. The camera is a high-end one, and it's supposed to be “weather sealed”, so I figure it should be fine in this light rain. Besides, I want to take some “real conditions” photos in the rain, and not just fine weather ones. So I carry the camera in its neoprene cover, and put a plastic bag over that, just in case. As we slush through the sodden track, I pause to take a few “here-we-are-in-the-wet” photos. Suddenly the camera makes a horrible noise – a kind of shuddering, repeated clicking – and refuses to take any more photos. I try to dry it off with a cloth, and try another shot, but it is not going to work. I put it back in my pack, exchanging “what-have-I-done?” looks with Lynne. We keep climbing towards Tonga Saddle. The Department of Conservation (DoC) has been doing work on the track and it is very muddy. The rain persists, and my anxieties about the camera swirl about under my ineffectual rainhood. We follow the roaring Richardson Stream down to Onetahuti. It is probably a beautiful beach, but rain and wind make it look as bleak as I feel. Knowing how the potential ruin of a great camera is affecting me, Lynne tries the jollying along approach. She points out the beautiful coastal glimpses, takes special interest in the disused Tonga Quarry, even grumps about the confusing times on some of DoC's signs. All of these are my default positions, but today I just want to finish walking and try to dry out my camera. 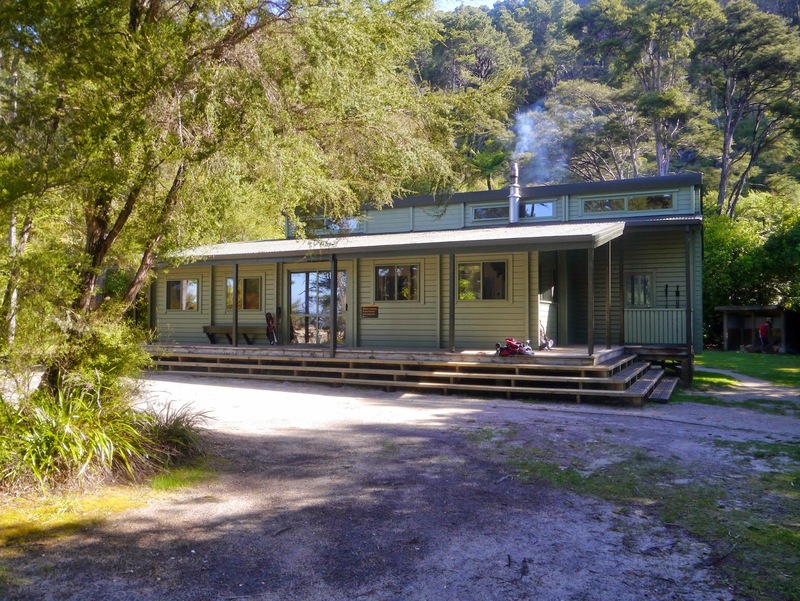 The swirl of smoke coming from the Bark Bay Hut is a welcome sign. So too is the blue sky that has beaten back the clouds. There’s only one other walker inside the hut, a young Malaysian, and he’s making full use of the fire he’s got going. He quickly moves some of his gear aside to allow us room for our sodden kit. Crucially there’s some drying warmth for my camera too. I take out the battery and card, put a silicon sachet in the battery well, and leave it to dry, fingers crossed. After changing into dry clothes, and despite my worries, I can’t help but enjoy the beauty of Bark Bay. 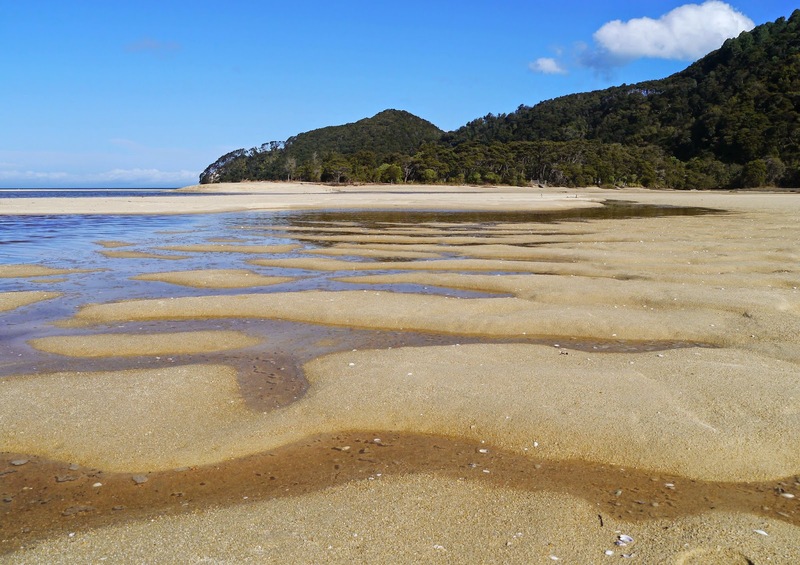 It is yet another stunning estuarine beach, shining afresh after the recent soaking rain. It is surrounded by thick coastal forest, and there are birds in profusion, variously calling, flying, wading and strutting. Lynne takes her camera out on the beach, making a special effort to take photos that I might have taken. Not for the first time I’m thankful for such a wonderful friend and partner.